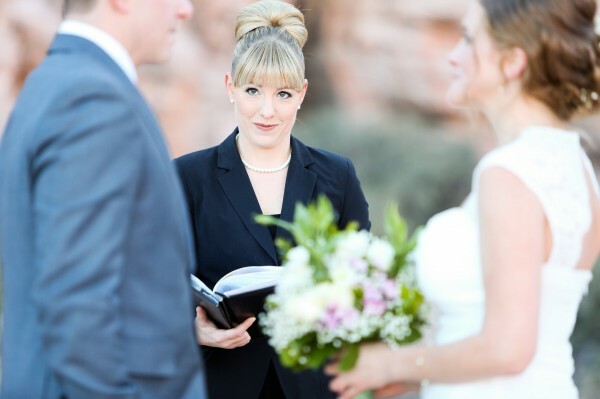 Angie Kelly is a name that is synonymous with intimate, personal wedding ceremonies in the Las Vegas area. She has a unique angle and reason for making wedding ceremonies as memorable as possible. Her passion comes based on a reason that may surprise you! She performs wedding ceremonies all over the Las Vegas area – from the tops of hotels in the most extravagant of suites to exotic gardens to the desert landscape. And she prides herself on providing intimate, personal wedding ceremonies to couples she may not have even met face to face! For those readers out there who may not know who you are, please introduce yourself and Peachy Keen Unions! Hi there, I’m wedding officiant Angie Kelly, owner of Peachy Keen Unions in Las Vegas! I specialize in performing contemporary marriage ceremonies. I am the wedding minister for modern-day couples! Uniquely I am; which has given me an advantage within the industry. I’ve watched the evolution of Vegas weddings since I was a child and am thrilled to embrace my home town as the wedding capital of the world! How many years have you been in business and how did you initially get into officiating? Peachy Keen Unions was established two years ago after gritting my teeth during my own marriage ceremony. My husband and I experienced the regret of not having a ceremony that best represented our viewpoints on love and marriage. I am a very passionate, cultured and open-minded individual…who left the altar underwhelmed and a bit embarrassed. Not only did I vow to my hubby that day, but I also made the promise that no bride would feel this way under my watch…here I am, a couple hundred weddings later, with several awards under my belt! What were you doing before you got into performing wedding ceremonies? For several years I worked as a private flight attendant traveling internationally, which is where my interest for (wedding) customs and traditions spawned from. Prior to becoming an ordained minister, I work in social services. The day I started Peachy Keen Unions was the day I stopped consulting for various mental health practices in the valley. Is there any time of year that is particularly busy for you? In Vegas, weddings are performed seven days a week! I try to stay under 30 hours a week, but March-July are off the charts! I keep odd hours, so routine communication is done via email. However, for custom wedding ceremonies, I need to see the engaged couple’s chemistry to really get a sense of who they are together. So my consultations are done in person or through Skype (for international or out-of-state clients). I know you pride yourself on providing as personal a ceremony as you can. What is the process like for fine tuning a script with the couple, especially if you’ve never met them before? You’re correct; the key to my job is representing personal love stories! That task usually means reducing a 3, 5, or 10 year history down to an 8 minute narrative nestled amongst the legal verse and traditions we all come to expect. During the consultation, I look for relationship themes and brainstorm creative elements – always conscious of getting emotional “buy in” from guests to prevent monotony. To achieve this, I also exchange questionnaires with the couple post consultation…plus, I stalk their Pinterest boards to see what I might have missed! I am most proud of my early business decision to provide clients with a draft copy of their ceremony in advance. I encourage couples to make edits, ensuring I’m conveying the perfect tone for them. It is not my marriage, so my beliefs are immaterial; I think having this stance is what sets me apart. Do you have a favorite Vegas venue to officiate at? Do you perform ceremonies all over Las Vegas? My heart throbs to have a barefoot groom on a boulder at Red Rock, watching as his gowned bride walks towards him while an acoustic guitar plays in the background. Equally, I love walking through an unexpected venue (museum, school yard, dirt lot) as it prepares to transform and hold 200 guests whose energy will feed me for days! It’s always exciting to encounter high-quality production elements coupled with an intimate ceremony setting. I feel the Mandarin Oriental encapsulates that best and has stellar service. I perform ceremonies of all sorts in all spaces; everything from houseboats to penthouses (love the one at the Trump International Hotel)! In addition to performing wedding ceremonies, what other services do you offer? I perform commitment ceremonies and vow renewals too – they are handled in the same process as a typical wedding. So, though they are slightly different, I view them as an almost identical service. Different states have different legalities for ceremonies. Should a couple be unable to find an officiant back home that fits their style, or maybe they desire a friend to officiate, I help them by offering my writing services. We go through the consultation process all the same but, instead of me performing the ceremony, we use my time to “coach” their designee. My words, their delegate. It is a wonderful option for couples who are DIY but have no clue where to start or how the formalities occur. As a hidden value, I provide ceremony “design” advice if my clients desire assistance. I am not a wedding coordinator or planner, but it is nice to collaborate on chair positioning, ceremony lighting, processional, microphone selection, music timing, etc. All those choices influence the ceremony’s ambiance. Do you have a favorite style of wedding to officiate at? I have been immersed in “cultural fusion” ceremonies lately and I hope they keep coming my way. Fusion ceremonies are when my bride and groom have different cultural or religious upbringings and we represent them both at the altar. Having the families acceptance and seeing all the components adapt is a challenge which gives me great reward. On a typical Sunday you are usually….canning food and couponing. Or reading work email in the car while my hubby wants me to rock-out to his iPod playlists. What exciting past times! If you weren’t an officiant, you’d probably be…a venue owner. It will happen one day, just need a few acres on the outskirts of town. Investors welcomed! Wow, thank you Angie! Her approach to weddings and her dedication to the actual wedding ceremony are incredibly inspiring. I love how she is so conscious of weaving various wedding cultures and traditions together with others to make a truly memorable and important ceremony. It is worth mentioning that Angie’s Twitter feed is highly entertaining and interesting to read as she prepares her couples and herself for wedding ceremonies, and great for insight into the Vegas wedding industry. Love it! This is fab! So excited to have Angie conduct our wedding this summer! It’s going to be amazing, I’m sure! You’re so lucky, Melissa! Congratulations! She seems like a great person to officiate a wedding.